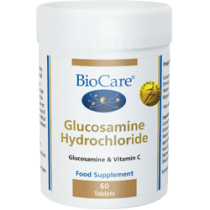 This product combines the hugely popular joint care nutrient, Glucosamine sulphate with another called Chondroitin sulphate. The latter is an important structural component of cartilage, the tough tissue that lines the surfaces of bones, and forms a major part of the extra-cellular matrix that provides much of cartilage’s resistance to compression. Chondroitin is thought to attract fluid into the cartilage and this enhances its elasticity. It is also believed to inhibit the proteolytic enzymes that break-down cartilage. 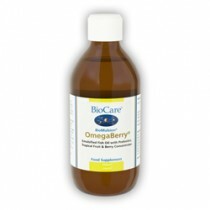 This product provides these two nutrients at levels that are effective. It is worth noting that a common practice with chondroitin supplements is to use preparations that are just 20% chondroitin, but the label declares this as if it is 100% chondroitin. Therefore a supplement declared as ‘400mg chondroitin sulphate’ is often just 80mg of chondroitin sulphate. However, this Lamberts® supplement uses 110mg of a 90% preparation to provide 100mg of pure marine chondroitin. Whereas glucosamine is essential for maintaining healthy cartilage by promoting its formation and repair, chondroitin is thought to attract fluid into the cartilage and enhances its elasticity. It is also purported to inhibit the enzymes that break-down cartilage. 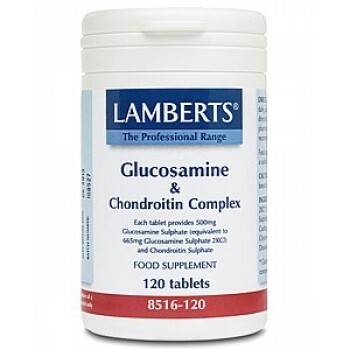 Each tablet of Lamberts Glucosamine and Chondroitin Complexprovides a full 500mg of glucosamine sulphate (equivalent to 665mg glucosamine sulphate 2KCl) and 100mg of pure, marine sourced chondroitin sulphate. Glucosamine Sulphate 2KCl is a pure compound derived from shellfish.